Have you ever noticed, as you search for your favorite recipe, that some search results show prep time and reviews, but others don't? The reason behind this is schema markups and rich snippets. In today's blog post we are talking all about schema markups and rich snippets. If you want to know what exactly they are, what they do, and how they relate to each other, you should definitely keep reading! Also I show you two ways of using them, depending on whether it is specific to rich snippets or not. 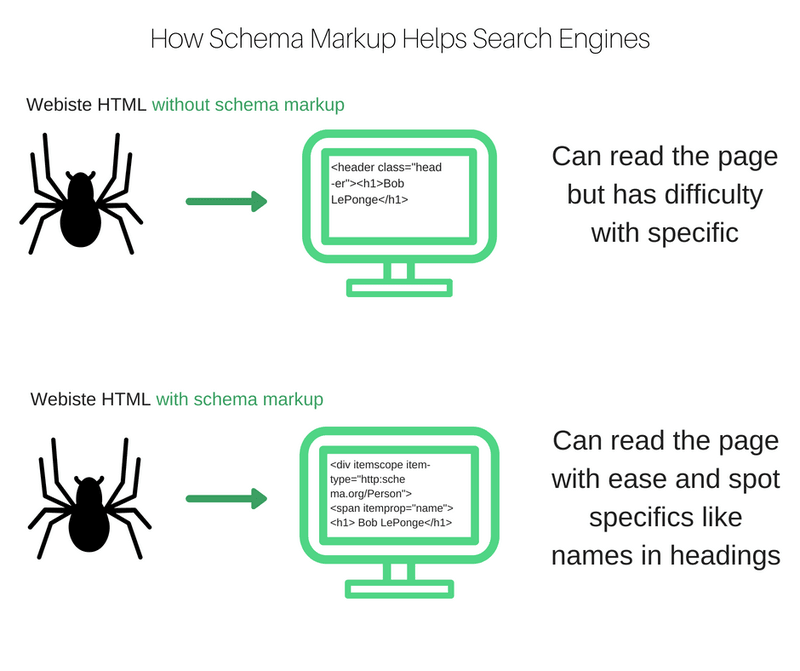 Schema markup is a code that you put on your website to help search engines more easily crawl your pages. Google crawls your page as usual and notices the schema markup like you would a sticky note in a textbook. For example, the crawlers will more easily identify your NAP because it is ‘highlighted' by the schema markup. Schema markups are not mandatory, however, without a schema markup, pertinent information would take much longer to find. A markup basically describes what is on your web page/website and what it means. Also, schema markups can show the context of pages that are ambiguous. You can add schema markups to your web page to create an enhanced description that appears in search results – this refers to a rich snippet. How do Schema Markups Affect My SEO Strategy? Schema markups affect your SEO strategy indirectly. For example, rich snippets make your pages show more often in search results because search engines have a better understanding of your web page's relevance. Furthermore, schema markup's increase your click through rate (CTR) and lower your bounce rate. Since you have a rich snippet in search result pages (SERPs), people can more clearly see what your web page is about and not need to click away from expecting something else. To begin, you should know that there are two types of schema markups. Micro data is often used to pin point specific parts of a single page. On the other hand, JSON-LD makes creating site wide changes more easy through the header code. Now, let's get into the meat of how to add Schema Markups to your web page! Go to Structured Data Markup Helper by Google. Choose the type of data you'll be marking up. Insert the URL of the page you want to markup. The screen will show your selected page and data items. Highlight and then select the type of elements to be marked up, repeat until you are finished with the page. Create your HTML by clicking ‘create HTML'. Download the automatically-generated HTML file and copy/paste it to your CMS or source code. You can use the Structured Data Testing Tool to see what your page looks like with your added schema markups. As I have explained, schema markups are a type of coding that allows multiple features within Google search. Rich snippets are an eminent example of these features. Using rich snippets allows search engines to return more relevant results, people can more easily see the relevance of specific results in SERPS, hence the higher CTR and lower bounce rates. In other words, rich snippets allow search engines to provide a richer search result, instead of just showing the regular information, search engines can provide more information about whether its a review, person, product, business, etc. Some examples of rich snippet features are GMB ratings, thumbnail pictures, cooking time, recipe ratings, calories count, ticket prices and event dates, breadcrumb snippets, etc. Furthermore, if a search engine algorithm thinks that a certain search engine query could benefit from a rich snippet box, then Google will feature the search results with extra information. With this, you can increase the possibility that search results will show your website with a rich snippet. First of all, you can only markup visible content and you don't have to markup everything on your page. However, the more you highlight, the better it helps search engines crawl your page. Use WP Rich Snippets, a WordPress plugin, however, you can also use All In One Schema which is free but very limited. Comments on Schema Markups & Rich Snippets: What They Are and How to Use Them?